Soon after taking my first workshop at the San Francisco Center for the Book, I knew I wanted to make book arts more than just a hobby. But after nearly 20 years in the computer industry, it was daunting to map out a mid-life change in course -- should I return to school for formal training? Where? Could I really put my life on hold for a few years and reutrn to school full time? What did I want to concentrate on -- fine binding, artist’s books, the content and design of the interiors? I’d like to report that I went about learning a new trade in an organized and logical manner. But I didn’t. Instead I made many starts and stops and detours along the way. One person who was much more linear in her approach to starting a new career is Annie Tremmel Wilcox. 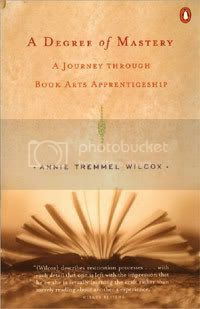 In her memoir, A Degree of Mastery: A Journey through Book Arts Apprenticeship (New Rivers Press, 1999), she alternates between her experience as the first woman apprentice to master bookbinder William Anthony at the University of Iowa and a lovingly detailed account of the restoration and conservation of a book she worked on. The long (5 year) apprenticeship program is rare today in the craft and trade world here in the US, but this throwback to the learning methods of an earlier time marries so perfectly with old books she learns to repair. I particularly appreciated and commiserated with Tremmel’s continual search for the right tool for each task -- I’m forever devising new tools to make my editions more efficient to construct. It’s an easy read, made more interesting because it’s about a community I’m involved with and objects (books) that I care about deeply. Just what I need, another book on my "to read" list! Thanks for this, sounds good.